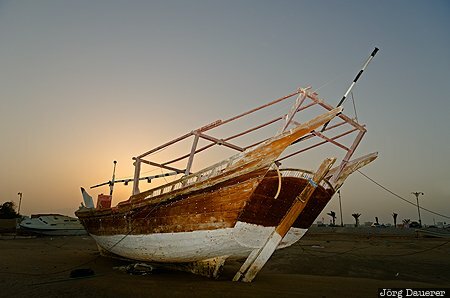 Sunset behind an old wooden dhow (or dhau) partially illuminated by a flash gun (used as a fill flash) at the coast if the Khor al-Butah Lagoon in Sur. Sur is in Ash Sharqiyah in the east of the Sultanate of Oman. This photo was taken in the evening of a sunny day in March of 2012. This photo is part of the exhibition Fill Flash (June 2016). This photo was taken with a digital camera.